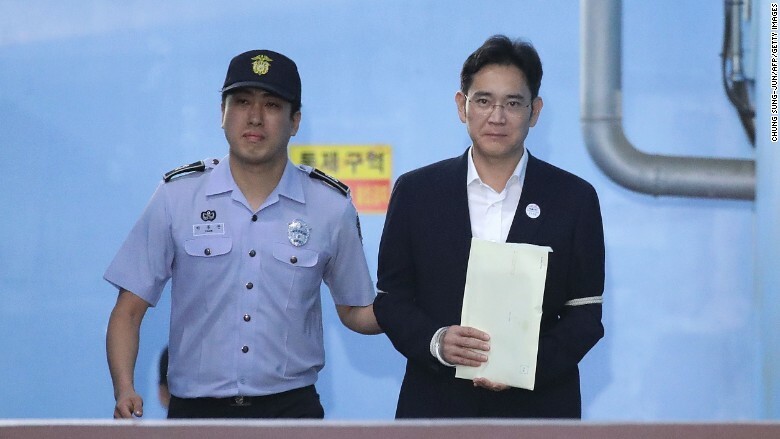 Lee, the billionaire son of Samsung's ailing chairman, was sentenced to five years in prison on Friday, well short of the 12-year sentence prosecutors had sought. The criminal conviction is a blow for Samsung, the world's largest smartphone maker and South Korea's biggest family-run conglomerate whose businesses are estimated to account for around 15% of the country's entire economy. The so-called "trial of the century" has gripped South Korea for months. It's part of a huge influence-peddling scandal that brought down the government of former President Park Geun-hye. "The public is disappointed that this kind of large-scale crime caused by cozy relations between politics and business still happens -- it's not in the past but remains a reality," Judge Kim Jin-dong said in court. He also laid some of the blame on Park, saying the former president made "aggressive demands" of Samsung. Lee Jae-yong leaving the court Friday after his conviction. The court also found Lee guilty of perjury, concealing criminal profits, embezzlement and hiding assets overseas. Lee has denied any wrongdoing, and his lawyers said Friday they reject the court's decision and will appeal immediately. 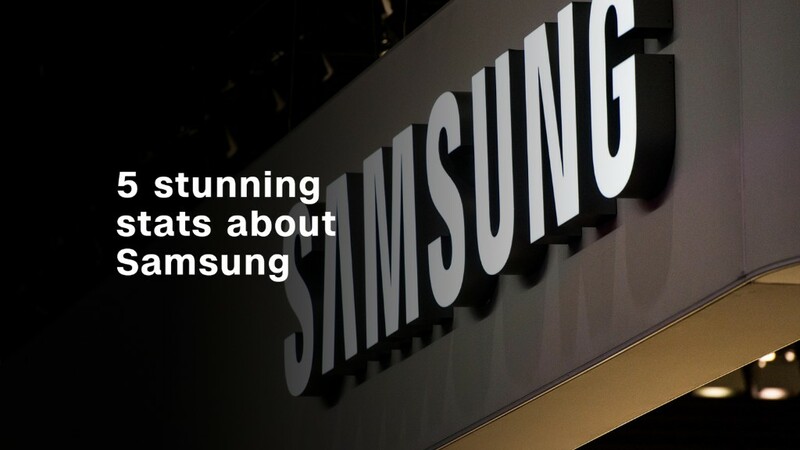 Samsung Electronics' (SSNLF) shares closed down 1.1% in Seoul following the verdict Friday. But the stock is still not far below the record high it hit last month. 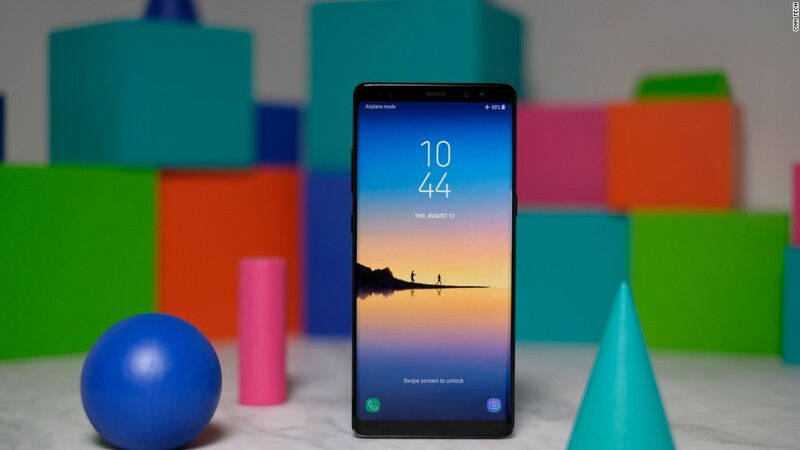 And although the guilty verdict is a black mark on Samsung's reputation, analysts said Lee's prison sentence is unlikely to affect the tech giant's day-to-day operations. The company has continued to post strong profits since he was first detained in the case. Lee is following in the footsteps of many other chiefs of South Korea's big family-run conglomerates, known as chaebol. His father, Samsung chairman Lee Kun-hee, was twice sentenced to prison -- and twice pardoned. Serving jail time "is like a rite of passage," David Kang, director of the University of Southern California's Korean Studies Institute, said in an interview before the verdict was announced. "The question will really be how long does he serve." Newly elected President Moon Jae-in campaigned as a "clean" candidate, promising to crack down on the power of the chaebol. The question is whether he'll eventually pardon Lee. Moon's administration "is just going to work with these companies," Kang said. "So how different is it really going to be?" A spokesman for Moon said Friday that he hoped Lee's case would be "an opportunity to eradicate the longstanding cozy relations between politics and business, which have been an obstacle to further advancing our society." -- Paula Hancocks, Lauren Suk, Taehoon Lee, Sol Han and Carolyn Sung contributed to this report.